I purchased the GoLite Shangri-La 3 for its light weight and features for me to try out my ideas for "small wood stoves for a hunters tents." I did not purchase the GoLite Shangri-La 3 Nest. If I did have an inner bug net it will only be for half of the tipi tent, because I need to have no tent floor at the entrance. The tie-outs, however, look likely for tying-in a reflective aluminized nylon "dew cloth" on one side near the bottom of this tipi tent. In addition, being able to tie-out the door looks likely for reflecting a small wood fire outside the tipi tent. 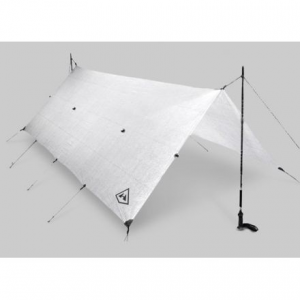 The Shangri-La 3 Flysheet includes a DAC aluminum pole, 6 GoLite DAC aluminum stakes and a stuff sack for everything and a stuff sack for the stakes. the "flame resistant fabric meets CPAI-84 specification"
2 1/2 lbs. feels about like a loaf of bread. The material feels sticky but not too sticky. It must be the fire retardant. After hanging up, that sticky surface disappeared. The door double-end zipper is heavy duty. The tie-outs are webbing, that are adjustable for length. Here you can see the color changes in different lighting. However, it does not look like the online photo. 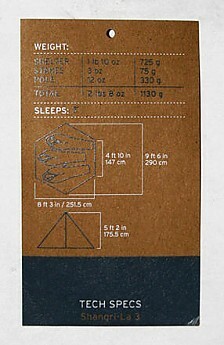 However, it does look like the MSS Modular Sleep System sleeping bag. That information should make many buyers pleased. The Shangri La 3 isn't anything like a camouflage outfit however. It has a grey section sewn along the door opening, not pictured at GoLite online, as well as, three grey GoLite Logo emblazoned vents for ventilation near the peak that are pictured online. In this photo, you can see the plastic inserts to make the vents stand out. 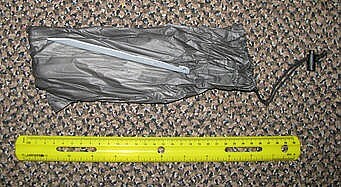 I only received six GoLite DAC 6 5/16-inch tent stakes, the minimum for pitching this tent "as is". There is a DuoMid pitch option discussed online, however that involves additional tie-outs. I purchased additional eight GoLite DAC aluminum tent stakes, in anticipation, because I want to use 11 GoLite DAC aluminum stakes for every tie-out around the perimeter, plus check out one or two stake out points from the attachment points higher up the sides, or, keep the panels at the door pulled back. If the stakes do not hold, there are other lightweight stakes to purchase elsewhere. I expect to purchase other stakes to see if I like those stakes better, and check out different pitching options. If you would rather use you own ski or trekking poles instead of the center pole provided, here is how to join the poles. The floorplan dimensions are not online. Here it is. The GoLite photo online and their online description do not do the Shangri La 3 justice. The features are better features than I expected. I also think lots of military and ex-military would like that color, as I do, because it blends nicely in an outdoor environment and because it compliments their military gear. The fact is, more people are carrying a lightweight pack these days. When I have used this shelter, I will get back with a follow-up report. I have now used the Shangri La 3 on snow. It is my experience, the Shangri La 3 is suitable for snowshoeing in the mountains for winter camping. The Shangri La 3 is the right size for one or two. It was easy to warm up, the interior size and volume is just right. I was winter camping solo. In contrast, my Black Diamond Megamid has, in my opinion, too much interior volume for one. I only used my stove outside in front of the door with the door open. I did add 70D aluminized ripstop nylon fabric spanning three panels of the Shangri La 3 I tied to the existing ties inside the Shangri La 3 that are provided for tying-in the Shangri La 3 Nest, with the aluminized side facing the door and the stove outside. I did not have a condensation problem. During sleep, I use a Polar Wrap Half Mask and so my breath did not contribute to condensation inside the tent. It also helps keep me warm. I did not use snow stakes. Instead, I put elastic cord around a stick with a slipknot and buried the stick crosswise in the snow, stepping on the snow to press it down. I was able to retrieve the cord. The Shangri La 3 was secure and the pitch was taut. I find it easy to setup the Shangri La 3. If you do not, the Shangri La 3 setup videos on YouTube are helpful. I had trees around nearby. Nevertheless, I can say the Shangri La 3 was unaffected by wind. I was in the mountains, here. It did not have an anemometer but the wind moved the heavy branches on Englemann Spruce vigorously for quite some time. The Shangri-La 3 stands up to Montana wind. I have the good sense to select a protected campsite. Nevertheless, the Shangri-La 3 proves itself. I feel I have a great tent. I would add, the Shangri-La 3 is so beautiful that it is a joy to have at the campsite. I am not bothered by biting insects because I select a campsite away from the water source. I also like to find a campsite just below a mountain ridge, for the views and for the fresh air. I use a MLD no-see-um headnet over my baseball hat. I wear long-sleeves and long pants. Nevertheless, the price is so favorable, the complete Shangri-La 3 is a good choice. If I had the complete Shangri-La 3, I would push back the inner Nest and floor. Either that or keep muddy boots outside. PROS: Very versatile shelter now offered at an unbeatable price. Roomy for two adults and a child, easy to pitch. A LOT of shoulder space. 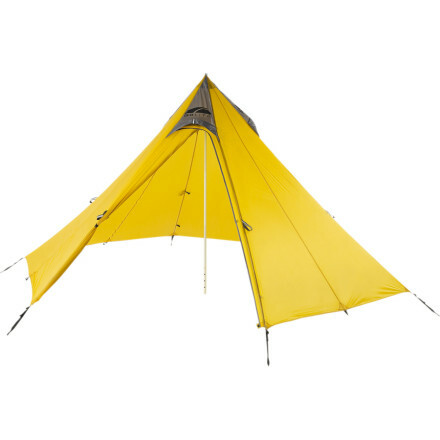 A fun tent to pitch and be in. I like to use the fly only, for added space and cooking possibilities. In this configuration, you can comfortably sit four adults to play cards at night. Also good as a winter shelter. Solid attachment points. Good ventilation. Centre pole is beautifully made. The door opens all the way up: no more crawling to get in and out. CONS: Fragile — Because of the very thin 15-denier nylon that the fly is made of, I would be reluctant to rely on it on a serious expedition, nor would I try sewing in a stove jack. 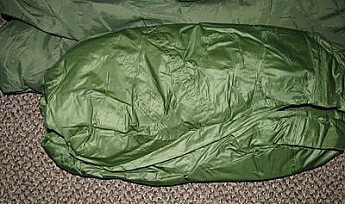 Also, the absence of a vestibule proper makes it hard to keep the interior dry or cook on a rainy day, unless you unstake one or two points of the nest to create a vestibule, which reduces sleeping space to a 1-2 man tent. 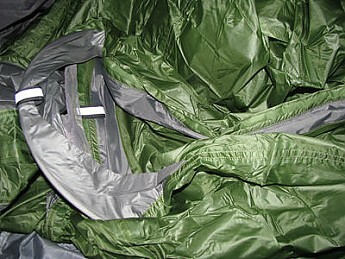 For full sleeping space AND a vestibule, you must build a vestibule with an extra tarp or poncho. The centre pole tends to sink on soft ground and move around on harder ground. Too bad Golite doesn't provide something to secure the pole in place on the floor. Also, I don't like the tiny stakes provided by Golite. 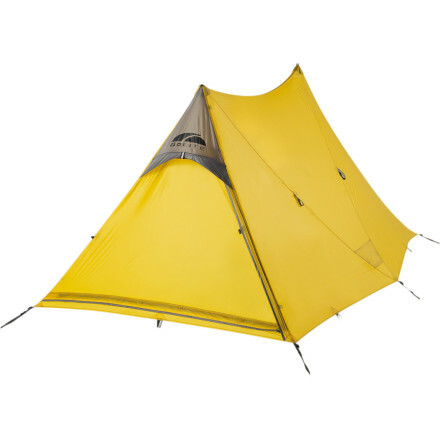 The Golite Shangri-La 3 is an excellent tent for its price. It was called the Hex when I bought mine about 10 years ago. 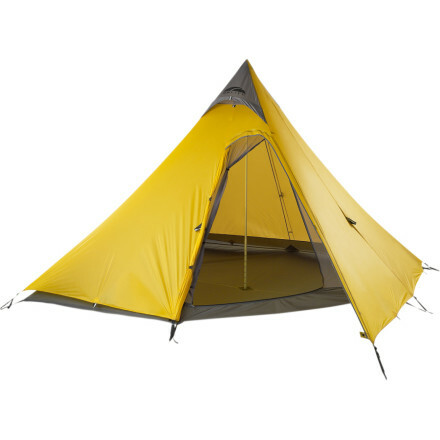 The tent is basically the same with a few changes and the price has gone up. But it's not an expensive tent and comes in three separate sections/parts. It has a rainfly that weighs about 2 lbs 7 oz and is usable by itself. With only one pole that can be ordered separate or replaced with a walking pole. The second part is a No-See-Em bug netting sewn to a bathtub style floor and weighs about 2 lbs 5 oz. It can be used alone in dry weather or with the rainfly for added stability. There is also just a bathtub floor that weighs in at 1 lb 5 oz and can be used as a ground sheet, or clipped to the rainfly to stay drier against the elements. 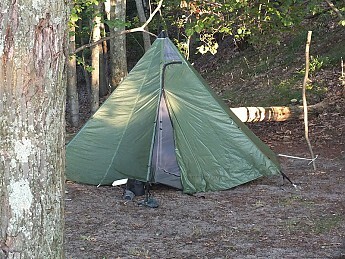 The tent also has a loop on the top and can be tied to a tree limb above to make more space inside. 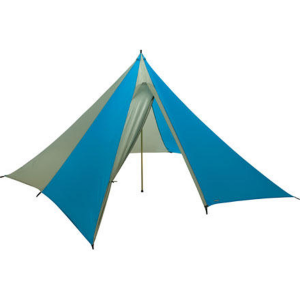 It is a two person tent with the pole, and a three person tent with the top tie loop. Staked out completely it will stand up to strong winds. 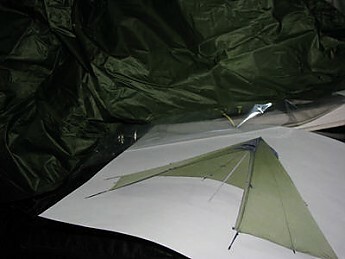 I have used this tent for about 10 years and like it as a second tent that is much lighter than my mountaineering tent. 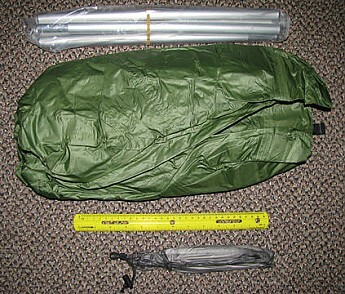 Each tent section comes with a stuffsack with a pocket on the outside for either the pole or stakes to fit in. Great three-season shelter! Holds two people plus gear with ease. Have used backpacking and car camping. Lightweight shelter for two. When split between two packs, even with floor, is very light. Offers better weather protection than tarps. Have used in heavy rain without any problems. I carry a chair leg glide to place under the center pole when camping on soft ground, it keeps the pole from sinking too deep and keeps the shelter taut. Ventilation can be adjusted by adjusting the height of the setup. While it won't keep out bugs I don't want to carry the extra weight of the net liner that is optional. It's light weight, surprisingly stable in high winds, and versatile. I've used this tent three times since I got it. The setup I have includes the internal nest and external tent. The first time I used it was in is the dead of winter. I just used the main tent part. It was along the Lake Michigan coast and the night I used it, about 6 inches of snow fell on it and it held up fine. 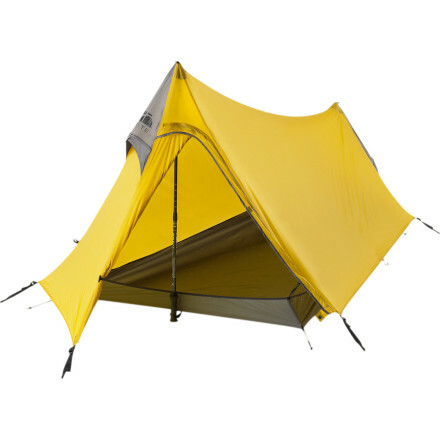 The next time I used it was this summer — mid July, again along the shores of Lake Michigan with both the next and the external tent. This time there were sustained winds of about 10 mile an hour. I set it up and it held fast despite the wind. The third time I used it was early fall backpacking in northern Michigan. This last time that I used it I got wet. It did rain for about two days straight but not torrential rain, just light and steady. It was also insane to set it up. I never had trouble setting it up but in the fading light of the day it just wouldn't work. It is hard to line up the mesh inside door with the external door and make it fit right. Also it sometimes requires two people to set it up which the defeats the purpose of this being the go to tent for a solo backpacker. Lastly it's a tight fit. 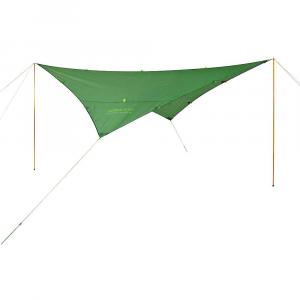 The one time that I just used the external tent part, I tied off the top of it to an overhead branch. I didn't even use the pole that time. In that situation I had some room, but I didn't really want to spread out all that much since it was about 10 degrees out. But the other two times I shared with someone else and it was tight - and be careful you don't knock the pole down. All in all I'll probably keep using it for solo trips. It replaced a Eureka Zeus 2 that gave out on me. I wouldn't recommend it for anymore than one person and I'd recommend it primarily in weather that isn't wet. The GoLite Shangri-La 3 is not available from the stores we monitor. It was last seen October 3, 2014	at GoLite.com.